Aurora Model keeps adding nice posed complimentary figures to the series of female members serving in different branches of German Army during World War II. The figure ML-033 is another 1/35 scale metal German Red Cross Nurse posed sitting on knees next to a wounded person and taking first-aid material from her bag.It makes a nice vignette with figures ML-031 and ML-032. During the World War II, almost all branches of the German army had its own medical personnel but none of them had its own nursing staff. All nurses were provided by the DRK - Deutsches Rotes Kreuz (German Red Cross). The German Red Cross helferin (helper nurse) was a vital part of the war effort in World War Two. Due to the German ideal of the three Ks "Kirche, Kindern, und Kuche" (Church, Children, and Kitchen), women in the armed forces were unthinkable. With it’s entire population mobilizing for war, Germany had to enlist all the help it could get on the home front; this meant that everyone was put into some branch of service to benefit the war effort, women included. There were a few choices for women in the Third Reich if they weren’t mothers, which exempted them from service. They were able to become farm workers and laborers, nurses, or one of a few other positions vital to the Reich such as Signalhelferin (signal helper) and administrator for the armed forces. Nursing was often seen as the most glamorous option, so it attracted many women. To keep women out of harm’s reach, field hospitals that employed female nurses were required to be at least fifteen kilometers from the front lines. Wounded soldiers knew they would be all right when they found themselves in a field hospital surrounded by nurses. It was not unheard of for these field hospitals to be overrun in a fast-moving advance, so nurses were sometimes taken as prisoners, although they were generally treated with a great deal of respect for their position by the Allies. A rather large range of uniforms were worn by RDK personnel in two basic categories ; those worn by the professional career members of DRK staff and those worn by the regular DRK nurses. The basic uniform worn by the DRK helferin during wartime consisted of medium grey pleated-front blouse or a blue-grey pinstriped blouse with a white collar as in this figure, combined with a skirt in matching color. The white collar is detachable for washing. Over the ward dress, helferin wears a white color, bib-fronted type ,under-knee length apron. The headdress is a starched white nurse cap with a woven band stitched along its front edge showing a red cross or alternatively the letters RK. They wore black silk stocking and black lace-up shoes. The DRK nurses carry a white armband with a Red Cross emblem surrounded by the words Deutsches Rotes Kreuz in black Gothic script on the left sleeve. Aa all Aurora Model figures, this one also comes in 12x7 cm transparent zip-lock bag with a company label stapled on the top of the bag. Inside the bag; there are 2 small paper sheets ; one with the information about the figure in Japanese and English, the other with a painted photo which can be used as a painting guide. It is noted on the information sheet that the metal of the figures contains lead. Figure parts are secured in another plastic bag. The figure is sculpted by Kiyushi Tsuda aka SOLO and cast in 3 white metal parts. The cast is quite good, there are only a few slightly visible vertical seamlines to clean. A quick sanding will be enough to make it ready for priming. Body with head and left arm : Facial details, hair, starched nurse cap, apron straps, collar and medical kit crossed on right shoulder are quite well represented. Uniform details and cloth folds are also well defined. Left arm is posed holding the medical bag. Legs : Legs posed sitting on knees with stocking and leather shoes. It makes a good fit to the body. Right arm : Posed to take first-aid material from the medical bag. The following books can be useful when painting these figures. Another nice posed complimentary figure from Aurora Model. Sculpting and casting of the figure is quite good. 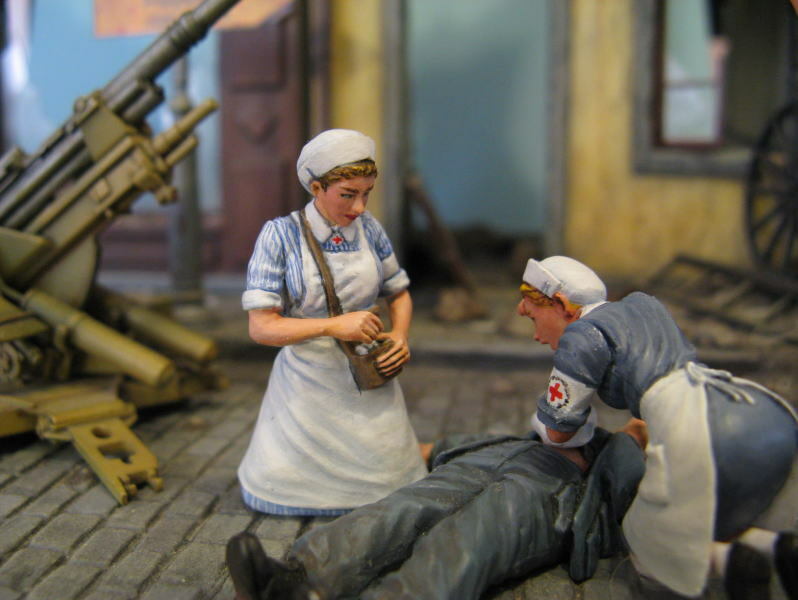 It can be displayed in dioramas or vignettes with medics in field hospitals or first aid posts or together with wounded German soldiers on battlefield. Highs: Ease on assembly with less parts. Lows: Some seamlines to clean on parts. Verdict: Nice figure but casting quality is hard to compare with latest resin figures on market. Our Thanks to Aurora Model!